dOGUMENTA America’s first art show for dogs. Former Washington Post art critic Jessica Dawson, with the help of her Yorkie-Maltese (Morkie as they’re more commonly referred to, apparently) mix Rocky, has announced plans for an exhibition she’s calling dOGUMENTA. The show’s name is inspired by the major international art exhibition dOCUMENTA, except that Dawson’s has been curated just for canines. PARTICIPATING ARTISTS: Eleanna Anagnos, Graham Caldwell, Kathryn Cornelius, Merav Ezer, Eric Hibit, Margarita Korol, Tibi Tibi Neuspiel, Noah Scalin, Dana Sherwood, Paul Vinet. dOGUMENTA is a new species of art lover. With the change of a single letter, dOGUMENTA implicates dOCUMENTA, contemporary art’s most prestigious exhibition, while inviting a new breed of culture hound to the table. Given that humans have co-evolved with canids for 15 millennia, dOGUMENTA seems a natural—and stunningly belated—development. Writing in The Companion Species Manifesto, feminist theorist Donna Haraway posits that pups, far from being furry narcissistic projections, are “a species in obligatory, constitutive, historical, protean relationship with human beings.” Meanwhile, the primacy of biped culture is in question; we hear whisperings of the end to the anthropocene. Can we consider this the dawn of the canidocene? 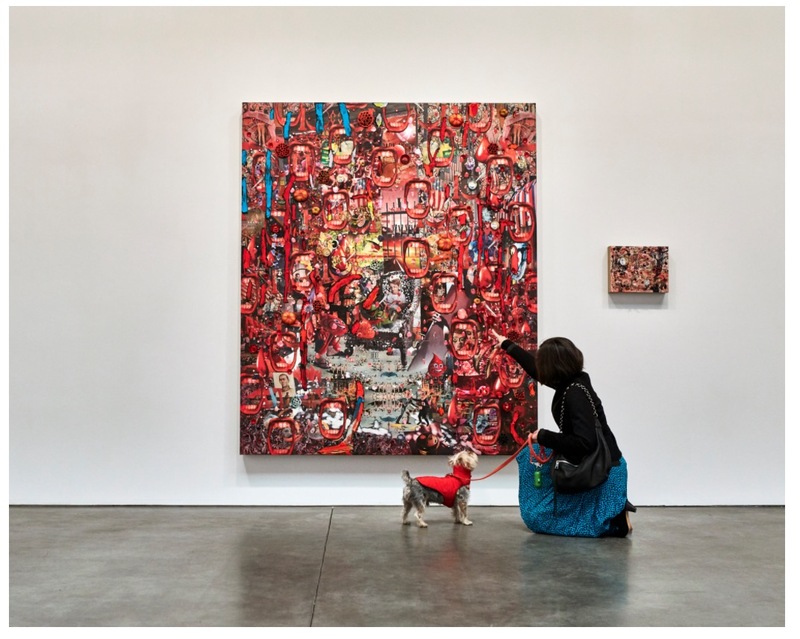 dOGUMENTA evolved from the gallery walkies of a spirited Morkie named Rocky, a dog without a degree in art history or an avowed interest in Artforum. It’s true that Rocky hailed from a tony neighborhood—his shelter was in Soho—but neither he nor his companion human could have anticipated what might happen once the pair began strolling Chelsea together. 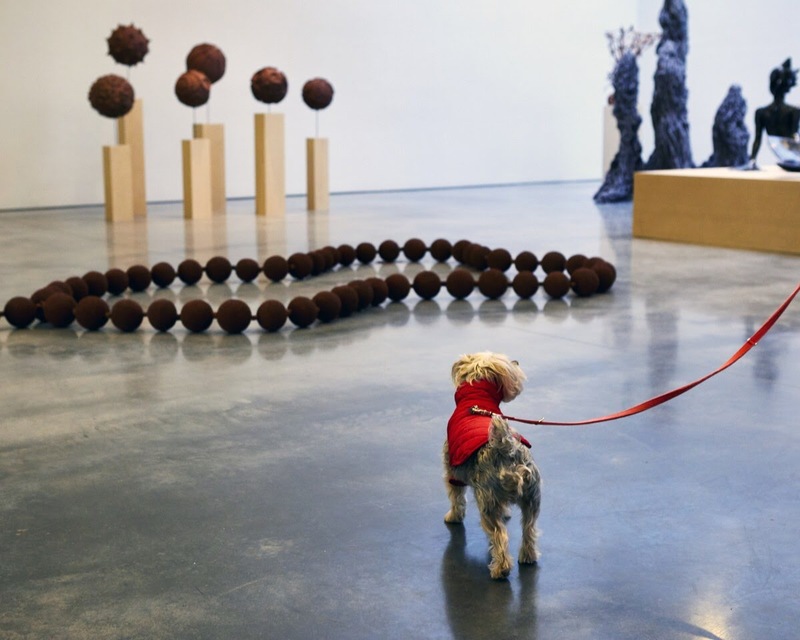 His human, a jaded art critic overwhelmed by New York’s art scene, noticed the pup vibrating with excitement as they passed the galleries, practically begging to visit Pace, Bonakdar, 303—even Gagosian. His joy was unbound: What the critic thought was doggerel, Rocky just howled over. What the critic felt compelled to love, Rocky truly dug. Flummoxed, the critic asked herself, “What’s his secret?” Her discoveries led her to compose “5 Things My Dog Taught Me About Art,” the thesis she delivered to an audience of writers, artists and curators on a winter’s night in 2016. That night the critic bayed and howled, calling on the assembled to rise up and embark on a new movement—a movement called dOGUMENTA. Rocky’s human noticed that what her brain tuned out, Rocky’s nose smelled and smelled and smelled anew. Shows by ubiquitous art world darlings—Jeff Koons, Damien Hirst, Richard Serra —remained ever fresh to Rocky. How many times had the Morkie trotted down 22nd street in west Chelsea to sniff Joseph Beuys’s “7000 Oaks,” the artwork composed of paired trees and basalt columns lining the block? Rocky had been that way dozens, possibly hundreds, of times. Yet not once did Rocky give his human the stink eye. 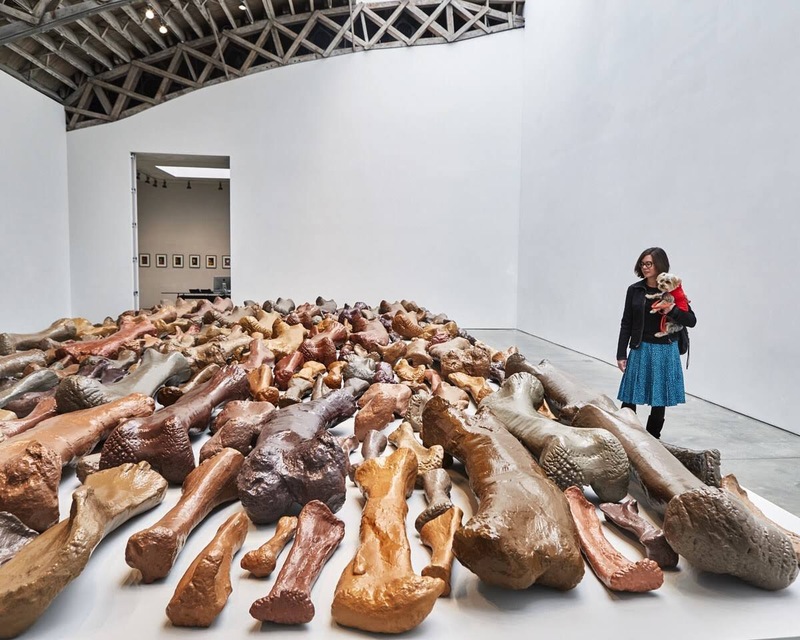 Not once did Rocky say, “Beuys…again?” Instead, Rocky strained at the leash as he made a beeline for the columns, pressing snout to stone and nosing with abandon as he took in all angles of these sculptures in the round. Some days Rocky even lifted a leg, peeing here or there, to share opinions with the canine art community. The work became a veritable message board for culture hounds. It’s a shame Carl Andre never met Rocky. The Minimalist would have admired the pup’s capacity to overcome the deep conditioning of museum guards and parents, voices demanding we maintain a respectful distance from works of art. A latter-day Guy Deborder Collie, Rocky recognizes no boundaries between life and art. To Rocky, an Andre is both an artwork and a slab of metal on which to cool his paws; he approaches it with unfettered abandon. Companion humans bring constraints, be they psychological or physical, to their art viewing experience. Some are colorblind. Some abhor abstraction. But Rocky? He checks his baggage at the gallery door. Like all canines, he has limited color receptors–dogs see hues of blue and greenish yellow—but that doesn’t stop him from delighting in the works of Dan Flavin. Nor does his different ability prevent him from savoring paintings rendered in unknowable spectra. Indeed, Rocky’s always up for a discussion of facture. Art world fashions come and go. Rocky ignores them. 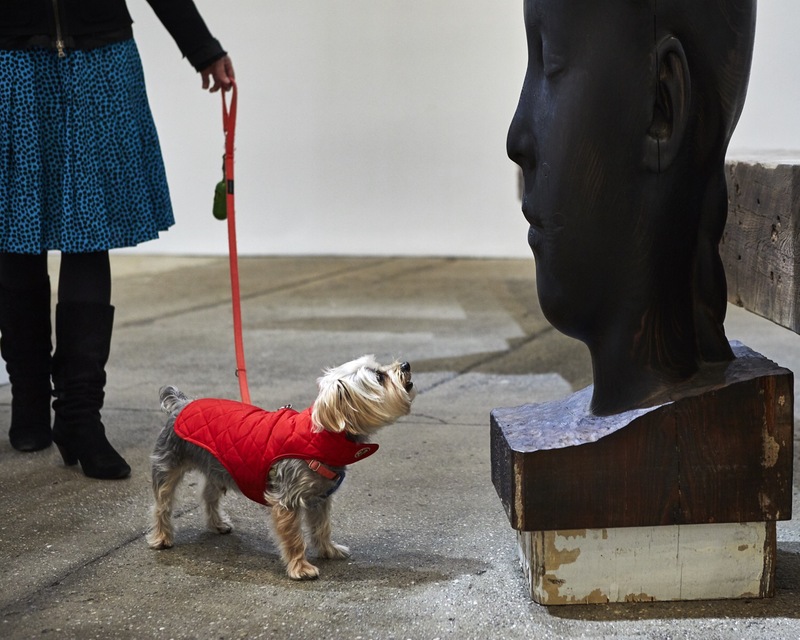 His attraction to realist portraiture is well documented—he’s been photographed sniffing the rear of Piero Golia’s “The Dog and the Drop,” an animatronic sculpture of a German Shepherd. Do such interests implicate Rocky as reactionary? Conservative? Perhaps. But disparaging Rocky’s mongrel taste is futile. dOGUMENTA goes with the gut. Rocky doesn’t read Roberta, Jerry or Ben. Rocky doesn’t see IG feeds or scan press releases. Rocky goes with his gut. When Rocky is bored (sorry Raymond Pettibon), troubled (apologies Bjarne Melgaard), repulsed (yes you, Carroll Dunham), or embarrassed (yup, Camille Henrot), he doesn’t question the validity of his feelings; he doesn’t murmur, Roberta really liked this…shouldn’t I? Instead of getting hot under the collar, Rocky turns tail and leaves. dOGUMENTA jettisons “good dog-bad dog” paradigms. dOGUMENTA is about mutual understanding. It’s about empathy, acceptance and compassion. The exhibition recognizes and celebrates difference. Bichon to Beagle, Chihuahua to Cairn, Sheepdog to Shih Tzu—the canine population is diverse. Human creatives would be foolish not to quest, however imperfectly, toward an understanding of the 4-legged taste. This is no shaggy-dog story. Rocky’s trailblazing curating is only the beginning. More canine curators will follow in his pawsteps. Imagine packs of them—Dogwui Enwezor, Klaus Bichonbach, Hounds Ulrich Obrist, Carolyn Christov-Barkargiev, Mastiffmiliano Gioni—helming the exhibition programs of the world’s major venues, from Mary Bone Gallery to The Museum of Maltese Art to the Rottweiler Kunsthalle. This is the art world’s future. dOGUMENTA is a call to action. Artists, curators, patrons and art lovers: The time has come. Our 4-legged friends have given us so much. Isn’t it time we gave back? This entry was posted in Art Stuff New York and tagged Dog Lovers, dogumenta, Jessica Dawson. Bookmark the permalink.